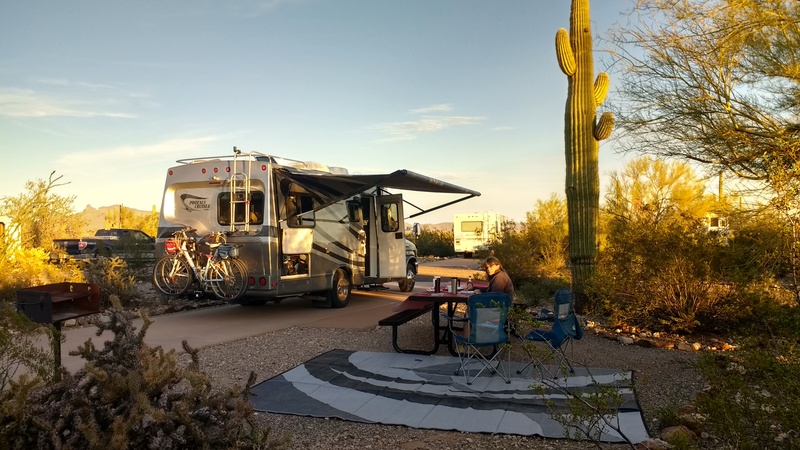 Note to our readers – we spent 6 nights at Organ Pipe National Monument and had no data services. In real time it is Feb 18. We are working to get caught up on our blog. 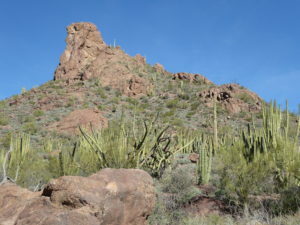 Our destination today is Organ Pipe National Monument. As we drive along the highway toward the park we can already see the beauty as the terrain changes to a lush green. 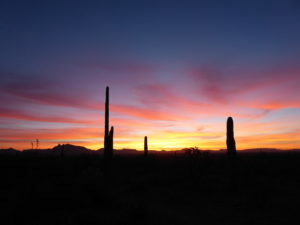 Organ Pipe is located in southern Arizona and borders Mexico. The park once had a reputation as the “most dangerous national park” because it had a steady flow of illegal immigrants and drug smugglers. In 2002 a law enforcement ranger, Kris Eggle was shot and killed chasing a drug cartel. As a result of his death, 70% of the park was closed for 11 years. Kris was only 28 years old. Today the park is safe and open to the public to enjoy because of increased border patrol security. The visitor center is named in honor of Kris Eggle. 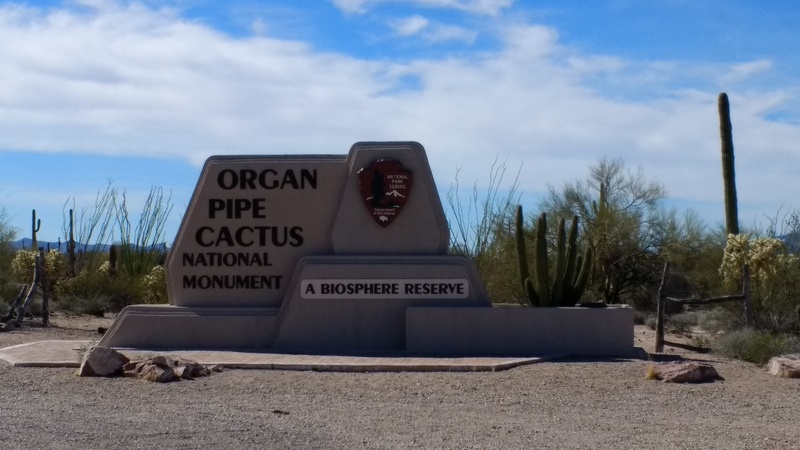 Organ Pipe consists of over 330,000 acres or 500 square miles of the Sonoran desert, where 26 species of cacti and numerous animals live. The Twin Peaks campground has 208 sites, no hookups, but is very nicely landscaped and quite attractive. Our campsite was #111 and we picked it because it had a few varieties of catci. 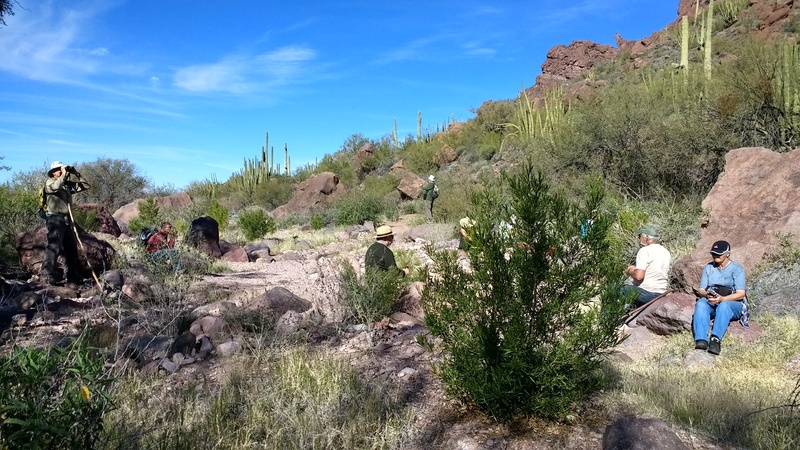 The monument had numerous ranger led programs, including ranger led hikes, evening amphitheater programs, location talks where van transportation was provided to the remote locations and van drop off for hikes on your own. All of this was provided with the park entrance fee. We took advantage of many of these every day we were there and got to see a lot of the park that way. 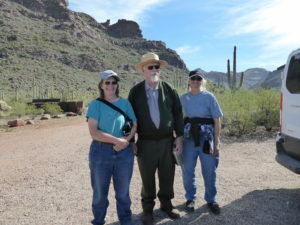 Our first ranger guided hike on was with Ranger Bill and we hiked 1.9 miles into Alamo Canyon. It was a location that had been used by the Gray Family for raising cattle. They Gray’s had squatted on a majority of the Organ Pipe Monument Land for years. This was a nice hike. Alamo Canyon – see all the Organ Pipe Cacti. That afternoon we went on a location talk with a ranger to Quitobaquito Spring. 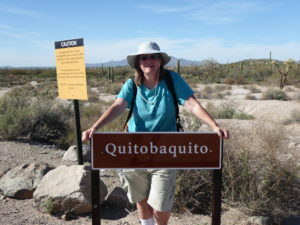 Quitobaquito translates loosely into little, little pond. 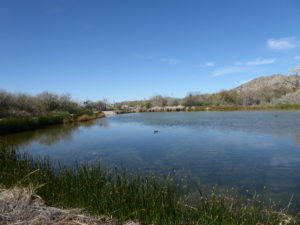 This beautiful desert oasis is right on the border of Mexico and has a unique species of pup fish. The hike walked around the pond to the headwaters of the underground spring. 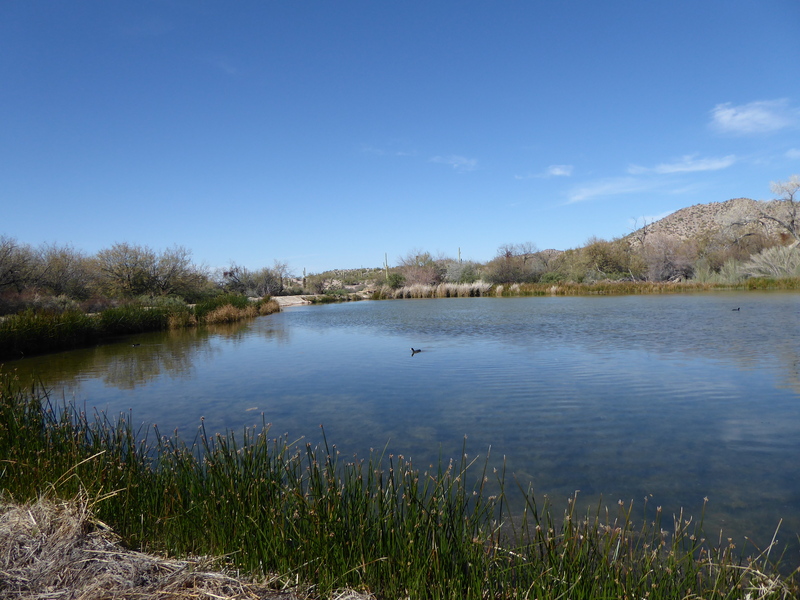 A pond in the middle of the desert is rare! 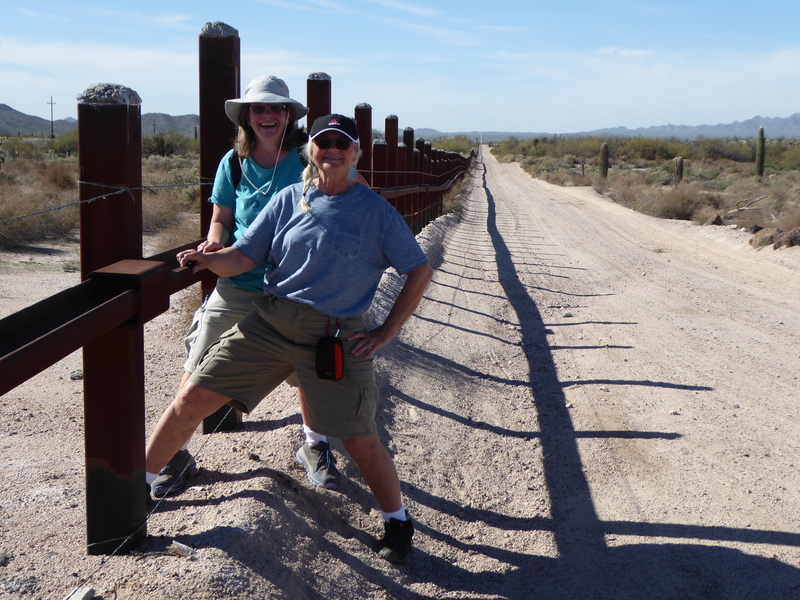 On the ride to the spring we were driving right along the Mexican border and could see the “wall” and the fence that defines the border. 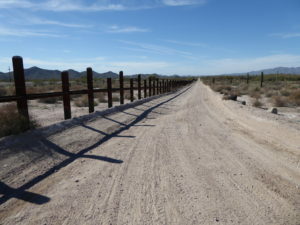 This fence spans the 28 mile border of the monument. 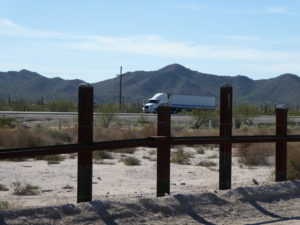 The low fence is recycled railroad ties and is a vehicular barrier fence to keep vehicles from driving into the monument and destroying the precious growth. It takes several years for some of the cacti to grow a foot. We actually dipped our toes into Mexico! 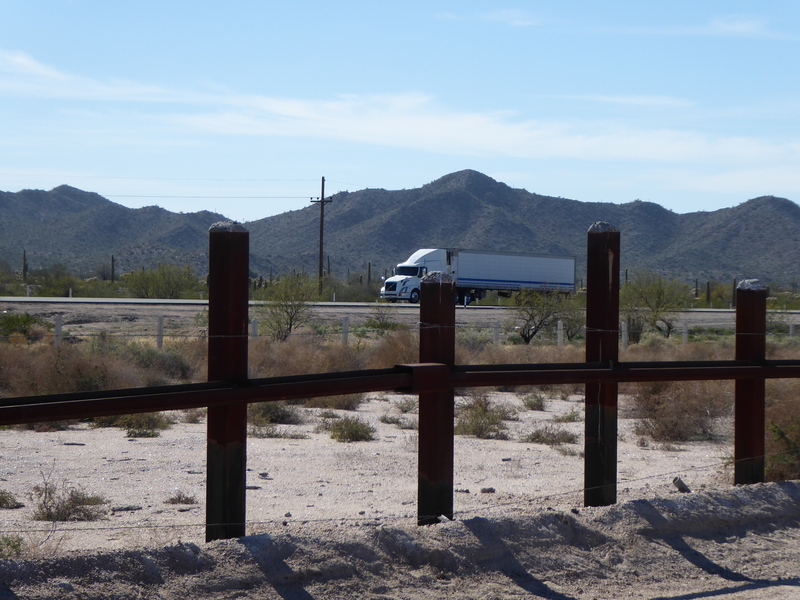 On the other side of the beautiful pond and spring was a fast moving Mexican Highway #2. Remember how we showed you an Ocotillo in a previous post and said it was a cactus? 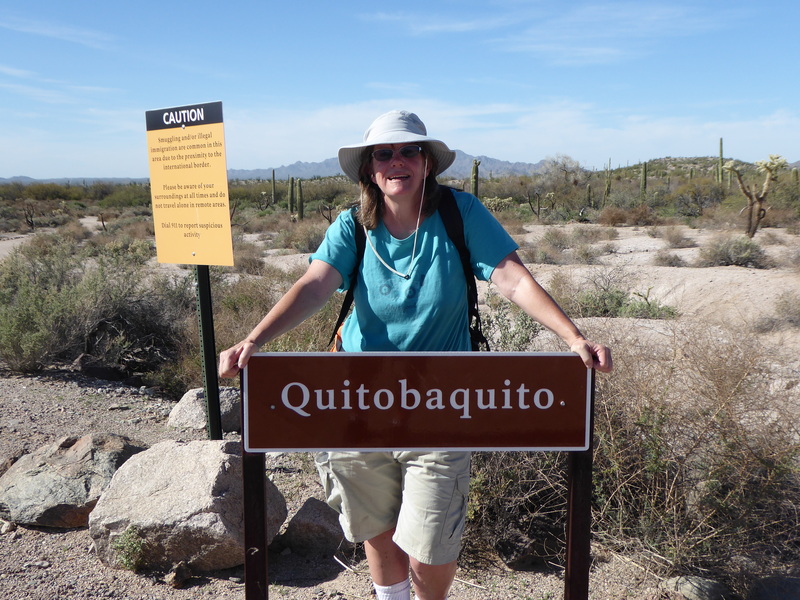 Well we have learned a great deal about cactci, and one thing that we learned, is that an Ocotillo is not a cactus! 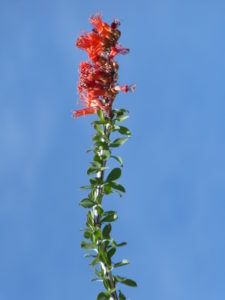 We did get to see one in bloom in our campground and it has beautiful orange flowers and its flowers are magnets for hummingbirds. The hummingbirds out west are a different species than the ones we are used to seeing back east but they have the same characteristics, fast and feisty and are really fun to watch. 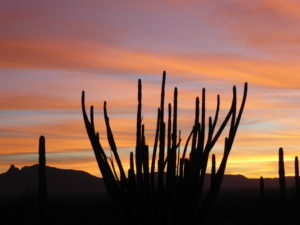 The Organ Pipe cacti only grow in the National Monument in the United States in this part of the Sonoran desert. The average height at maturity is 15 feet. 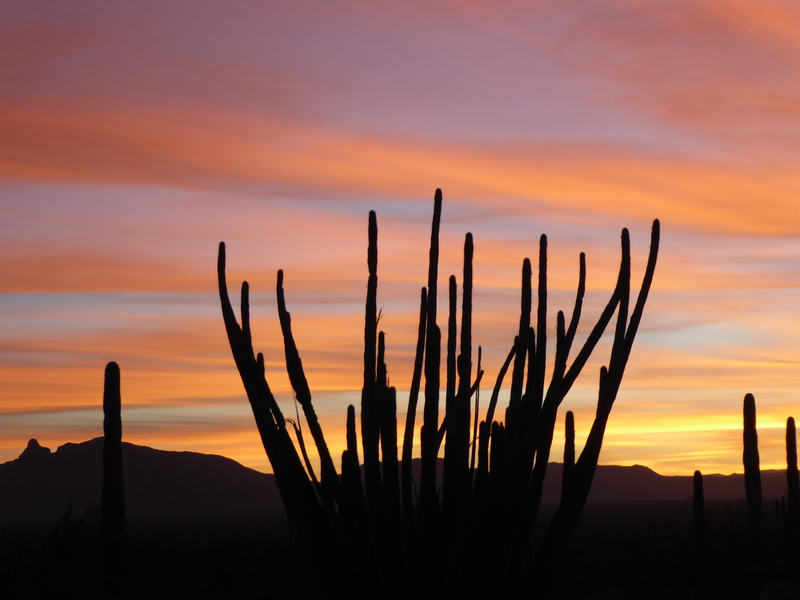 The early settlers who encountered the dead cacti thought they looked like church pipes. 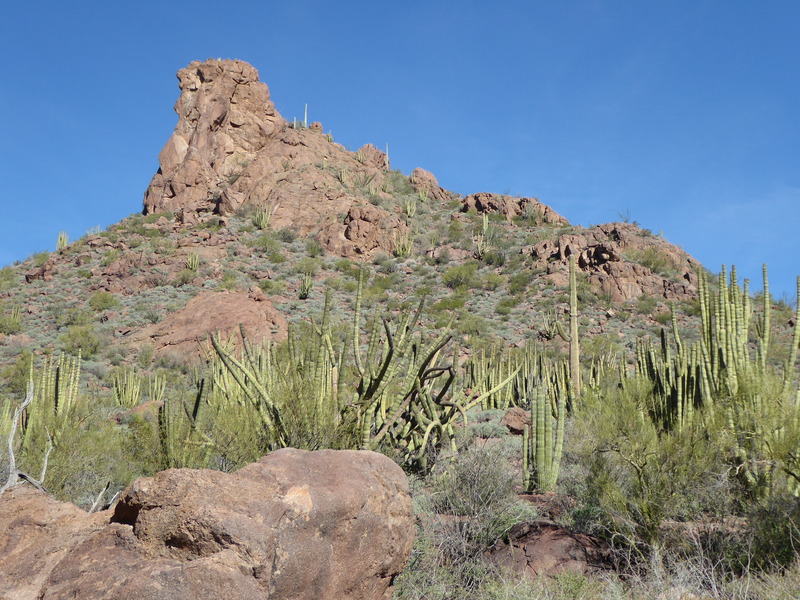 They are a type of columnar cacti like the saguaro. They make a lovely silhouette at sunset. We will leave you with a picture of the sunset we enjoyed. We will continue our telling you about our adventures at Organ Pipe NM in our next blog post. 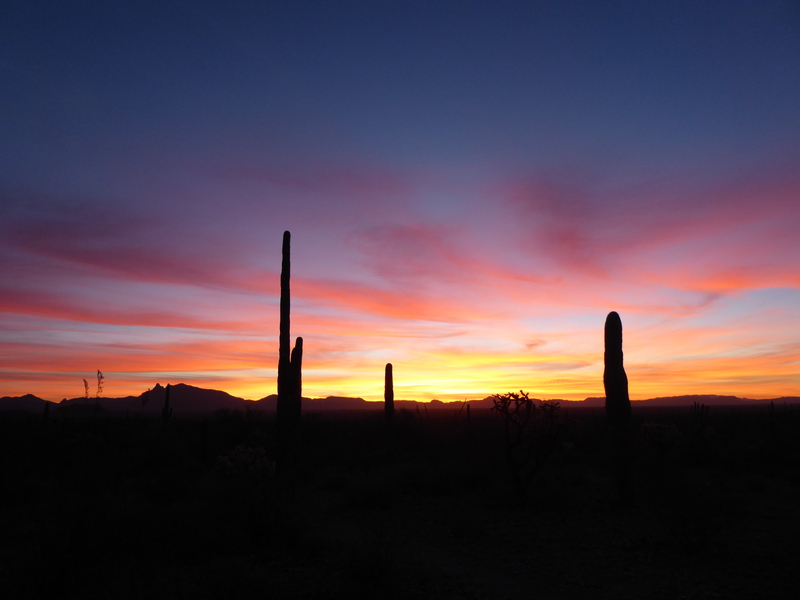 Another beautiful desert sunset. Have a good evening! This entry was posted in Arizona and tagged Organ Pipe National Monument. Bookmark the permalink. Sweet….this was worth waiting six days to see this beautiful blog!!! Glad you enjoyed it Gordon. We sure had a great time there! Okay, I am beginning to see why John’s memories of your family camping trips to the desert are etched in his brain and he so wants to return. The sunrises and sunsets are beyond stunning. We sure did have fun on those camping trips scrambling on the rocks, eating beef stew and gazing at the stars!